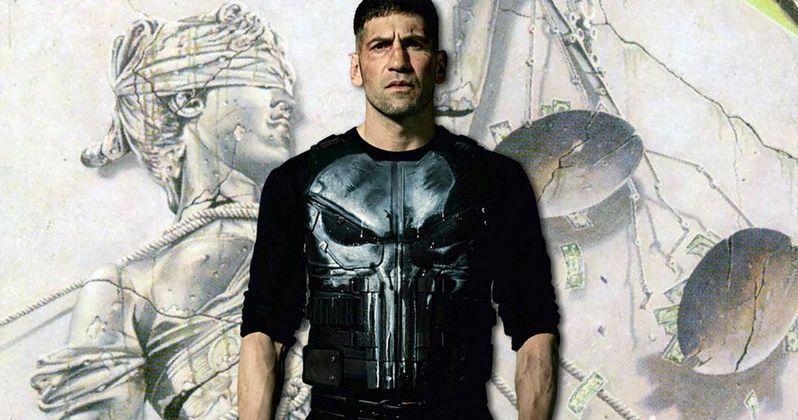 Netflix has just released the first real glimpse into The Punisher series and it has the most fitting soundtrack, possibly ever, with the infamous thrash-defining metal song "One", by none other than the monster that is Metallica. "One" is set as the brooding background music and taking to the forefront in the new awesomely bloody trailer. Not only does "One" fit the bill sonically, turning Lars Ulrich's snare fills into machine gun fire, but it also has new meaning when looking into the way that Frank Castle is portrayed in the new Netflix series and the whole story behind the new adaptation being spun off from the Daredevil series. Though the trailer features Metallica's "One," it does not follow the structure of the song as it appeared on the band's landmark album, "...And Justice for All." Instead, the song goes through a reimagining, much like Nirvana's "Come As You Are" did for the first trailer for Marvel's The Defenders trailer. The thematic and brutal song is reimagined and remixed to fit into Frank Castle's reality. Snare drums and muted guitars no longer stand alone as epic metal music, but are now re-envisioned as actual battle sounds while Castle turns into The Punisher and exacts his revenge. The same can be said for the iconic intro for the song that can be heard in music stores around the world. The main guitar riff of the "One" is transferred over to an acoustic guitar for the beginning of The Punisher trailer that features Frank Castle with his family and presents the iconic riff of Metallica's "One" into a theme for the everyman. The dark song takes on a kind of light when played on acoustic guitar and paired with Castle's domestic bliss. However, much like the song, all hell breaks loose and Frank Castle turns into The Punisher and all bets are off. The sweet duel guitar melodies played by Metallica's James Hetfield on the album are ignored as the trailer steps up into the world of terror and revenge. Instead, the trailer jumps right into the themes of "One." Netflix is going for a more well-rounded Frank Castle this time around, one that has his own Symphony of Destruction. Being the harvester of his own sorrow, the tailor-made song highlights the anti-establishment feel of the new Frank Castle that fits into the new series almost too well. The soundtrack is an important piece of the puzzle for Netflix and Marvel as Nirvana's "Come As You Are" was repurposed for Marvel's The Defenders, Metallica's "One" is used in a way that makes even more sense as the main character attempts his revenge against all that have murdered is family. Never mind the anti-war lyrics as well as the words that point towards piece, The Punisher has pulled the shortest straw and he's ready to exact his revenge. The heavier themes of Netflix's The Punisher lend itself to the slower, almost doomy pieces of Metallica's "One." While some fans will be more than a little bummed out that the music for "One" is not the same as it was presented on the iconic "...And Justice For All" record, it certainly serves its purpose in selling the new Punisher TV series. No official release date has been confirmed as of the time of this writing, but expect some news to drop really soon.